The Leadership and Education Fund for the Betterment of Women, Inc. (LEF) was established in 1999 as a 501(c)(3) charitable organization. Donations to this organization are tax-deductible and it is also able to receive contributions from other entities to fund programs within its charitable purpose. The goal is for the fund to serve as an endowment for The Trusteeship’s philanthropic endeavors. Please watch our NEW video to see some of our Awardees speak about how the Adrienne Hall Emerging Leadership Award has impacted their non-profit organizations. Remembering that the full name of our organization is The Trusteeship for the Betterment of Women, Inc. please consider making a tax-deductible contribution to this worthwhile fund. Meet Neema Namadamu. Neema is the founder of Maman Shujaa, a powerful women-led initiative that uses digital media to amplify the voices of women demanding peace in eastern Congo. Neema was born and raised in a remote village in eastern Congo. She was stricken by polio at age two – an illness that left her physically disabled. Although facing incredible challenges, Neema refused to be limited by physical and geographical barriers. She became the first women with a disability to graduate college in Congo, and the second woman from her tribe to graduate from Congo’s national university. Neema first used media to advocate for change as a young adult. In the eleventh grade, she initiated a one-hour weekly radio show to raise awareness and promote the rights of persons with disabilities in rural eastern Congo – a calling inspired by her own experience living with a disability. In 2011, Neema established Go Network, a national telecommunications company dedicated to connecting, informing and empowering women in eastern Congo. Go Network also serves to better connect Congo’s women to the national and international community. In July 2012, Neema’s 25-year old daughter was brutally beaten by government soldiers near their home in Bukavu, eastern Congo. 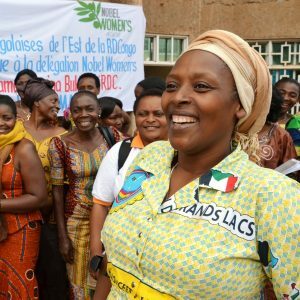 This incident, coupled with the ongoing conflict in eastern Congo, launched Neema to action for peace in Congo – she established the Maman Shujaa Media Center. The Maman Shujaa Media Center provides digital and internet literacy training to women living in eastern Congo. The women use this training to effectively share their stories – especially their desire for peace – with a broad online audience, garnered through WordPulse. Since its inauguration, the Maman Shujaa Media Center has become an internationally recognized voice for peace in eastern Congo. Neema is also founder of the Congolese Association for the Liberation and Development of the Disabled Woman (ALCODEMHA), an NGO that connects disabled Congolese seamstresses with international garment designers and distributors. She has been a correspondent for WorldPulse since 2012. To learn more about Neema please click here.